A beautiful thing has happened to the historic St. James Church in Hockley Village. It has become a vintage lighting shop. That means what it sounds like: the interior has been refurbished to a high quality and inside the old church is hung a wonder of antique lights, Art Deco, sconces, lights with faces, with stained and painted glass, ceramic and crystal chandeliers. Old lamps, made in Canada of brass, hand made and fabulous, stand on the counter. Overhead, a crystal chandelier, not big but endowed with hung crystal pieces, round and tear drop, to reflect prisms of light, to enhance any room. Every piece shines with having been polished to its best look. Next to it, an antique ceramic chandelier. There are figures carved of flowers and a cherub holds a bough, cream coloured, it is painted with leaves and flowers, the light held in sconces, a beautiful work of art, cleaned and refurbished. In the midst of it all is Vanessa Dragicevic, whose great joy in life is to rescue, repair and resell beautiful and interesting lighting. Sometimes, she makes new lights from old materials. Born in Slovenia, Ms. Dragicevic came to Canada with her parents in 1977. “My parents decided to immigrate here,” she commented. They loved the heritage look of the centre of the town and the comfortable feeling of the smaller community. More then that, they could see that there is a strong arts community in the town and the surrounding area. So, they brought their family of two sons and a daughter to Orangeville, where they found themselves settled in a place that suited them very well. Artistically, Ms. Dragicevic attended Sheridan College for photography, eventually teaching photography for the Catholic School Board from 1983 to 1997. In order to source her stock, Ms. Dragicevic has associations with “pickers,” people who shop for antiques and oddities. They let her know when they have found things they think she will like and either she approves or she goes to the market to meet them and view the items. These can be found in the antique markets at Aberfoyle, south of Guelph and at demolition sites, especially of old houses and other buildings. This means that her stock is always changing, “makes it great for my regulars,” she remarked. 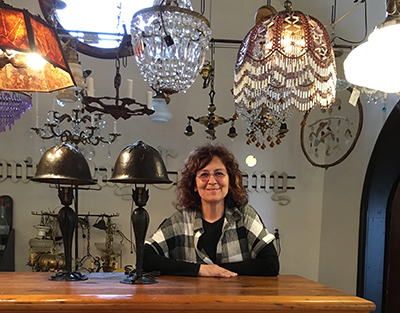 If so many of her pieces are unusual by virtue of their history, her shop is a place that can be visited over and over, with always something else to see. She said, “When I'm in my workshop, doing the rebuilding or refurbishing, the time flies by. I'm in my element. People do bring their old lights in for me to renovate. In a happy place, what Ms. Dragicevic wants for herself is to keep doing what she is doing.